Grading is used to describe how tumour looks like under a microscope to get an idea of how it may progress. If the doctor or surgeon suspects existence of cancer, he or she will take a sample of cells from tumour (a biopsy) to send to a laboratory for testing. The cancerous cells will be looked at under a microscope to try and find out the speed at which your tumour may grow and how aggressive it is. 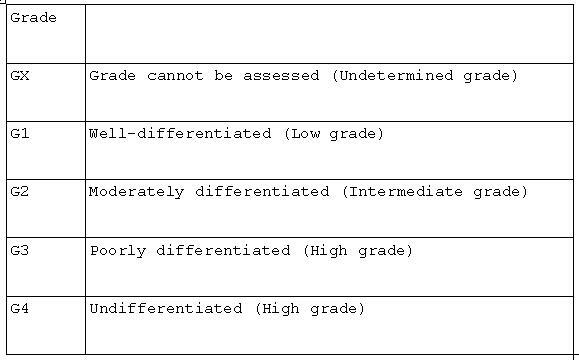 There are four grades (Fig: a) used to rate cancer. Low grade, or grade 1, refers to cancers that are slow growing. If your cancer is low grade, the cancerous cells may look much like other, healthy cells in your body. Low grade cells may be referred to as 'well differentiated'. They are less likely to spread. Moderate (intermediate) grade, or grade 2, refers to cancers that are growing slightly faster and are more likely to spread than low grade cancers. At this stage, the cancerous cells are known as 'moderately differentiated' and look different from healthy cells in your body. High grade or grade 3 cancer cells look very different from healthy cells in your body. If you have a high grade cancer this means the cancerous cells are likely to grow faster and spread more easily than moderate grade cancer cells. They may also be called 'poorly differentiated'. Grade 4 cancer cells look like 'undifferentiated', or 'anaplastic' those cells come under this grade. In the patient treatment the grading play major role. Lower grade higher the possibility of better prognosis and vice versa.